The Symposium noted elsewhere on this page called ‘Im Anschluss’ has now concluded. I should have mentioned earlier that the title of the symposium offers in German the double meaning of Austria’s annexation by Nazi Germany, (called ‘Der Anschluß’) and more commonly in normal conversation, it carries the meaning of ‘and in summing up’. It was thus a brilliant designation for a conference that was focused on the delicate question of keeping memories alive at a time when most are now turning into history. Indeed, ‘From Memory to History’ was the title of my own paper. I normally find Holocaust conferences fairly contentious as they inevitably focus on the one-sided interaction of Nazis and victims. In Germany and Austria there is much hand-wringing. Other occupied countries should occasionally join in the hand-wringing, but the ‘Nazi victim’ story is hard to resist. Little effort is taken to explain who the people or their communities destroyed by Nazi fanaticism were. Rarely if ever is there any information offered on the Roma and Sinti communities, though there is always someone about to tell us of their annihilation. Who were they and what was lost? We often look in vain for this information. The destruction of Jewish life in Germany and Austria fascinates much more as it was inevitably the destruction of German and Austrian life as well. The idea that fellow citizens would unilaterally declare their neighbours, friends and often, fellow family members as dispossessed and worthy of execution remains incomprehensible to modern, ‘enlightened’ societies. Paradoxically, we watch the Middle East succumb to the same incomprehensible ‘Bruderzwist’, an untranslatable term, which means simply ‘fratricide turned into war’ – a far more intimate designation than the political term of ‘civil war’. And as recently as the 1990s, we had the same thing in the former Yugoslavia. Unthinkable? One could at least comment that Yugoslavia or the Middle East had not become engines of social and cultural progress at the point of descending into their ‘Bruderzwists’. It does not make it any more comprehensible and to those who are living through events, it is just as bewildering and tragic. I had believed that I had heard all of the Holocaust Survivor accounts possible for a single life-time. Conversations with relatives, friends and colleagues who had survived the camps have convinced me that ‘survivor guilt’ is not an abstract concept. Every survivor carries with them the memories of those who were murdered in their place. This is not something that any survivor can easily speak about. To survive took wiles and luck and the torture of such memories is far worse than the physical hardships survivors were made to endure. It’s easier to talk about brutality than it is about the means by which each person clung onto their own existence, inevitably at the expense of others. But this conference, which was presented at Vienna’s University for Music and Performing Arts had very little to do with either music or the performing arts. It was about the use of such means as education once we’ve lost everyone who has remembered events. For this reason, two presentations were particularly moving. One was about the Austrian women in the Ravensbrück concentration camp. The website remains in German, but offers accounts of the Austrian women who landed in Ravenbrück and the diversity of the interviews and stories is eye-opening: criminals, those deemed ‘anti-social’, political prisoners; Jews and Gypsies were all locked up together. The camp became the source of enforced prostitution with young women sent to work in the bordellos of other concentration camps – some bordellos were meant for inmates, others for their guards. As so many of the women interviewed in old age spoke local dialects, the site offers a transcription in German that runs absolutely parallel to their interviews. It reminds everyone how ordinary people were scooped up and imprisoned, often for only moving in the wrong circles or even for listening to the wrong music. But the real eye-opener for me was another event altogether. We had a visit by a youngish looking elderly lady. She was vigorous, slim and attractive with the dyed blond hair that many elderly women now sport. Her name was Dr. Katja Sturm-Schnabl and her story is told in ‘Lives Remembered’ published by Austria’s ‘Nationalfond’ (To view the English edition, scroll down) She’s actually featured on the cover of the book holding a photo of herself in 1942. It is the photo with which I illustrate this short essay. Her story was new to me, though it should not have been. Especially since as long as I can remember, the ruling political party of Austria’s State ‘Carinthia’ (The Federal Republic of Austria is divided into 9 States), has waged a public and deeply offensive campaign against the Slovenian communities found on its Slovenian border to the Southeast. In 1918, these regions voted in a referendum to join Austria at a time when Austria was not thought of as an exclusively German speaking country. Before the treaty of St. Germaine, Austria’s German speakers were in the minority and the country’s borders took in the present-day Czech Republic, much of Poland and the western Ukraine. Afterwards, it gained Hungary’s German speaking regions but lost its German speaking South Tyrol to Italy. That Slovenian communities would choose to join Austria at this point in history was not so illogical. They were farming communities who had lived in the region for millennia. Dr. Strum-Schnabl told us the harrowing account of being disposed by the Nazis, their farm being taken away and handed over to Germans being repatriated from South Tyrol or Romania. The family was sent to a slave labour camp and as a 6 year old, she was very aware of what everyone was going through. When partisans scored a local victory in the Balkans, the camp’s authorities held retribution executions with victims chosen at random. When her younger sister was taken ill (slave labour was only required of those over the age of 13), the camp doctor, (a female doctor in this case) gave her a lethal injection in front of the entire family. 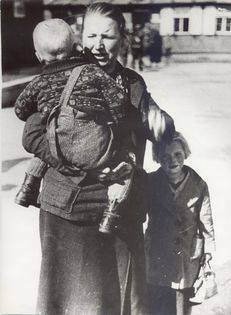 With the end of the war, German speaking Corinthians told the British occupiers that the Slovenian families were not victims of Nazi racism, but criminals. They were packed off in the now familiar cattle carriages and deported to other internment camps until the matter could be resolved – mercifully, in favour of the dispossessed Slovenians. Such ‘ethnic cleansing’ had consequences, resulting in the equally brutal, forced removal of all German communities to the east of present day Austro-German borders – most of which had also existed for a thousand years. Yet what saddened and surprised me was the fact that nobody among the Austrian or German participants of the conference had been aware of this chapter of Nazi history. Worse, one of the most enlightened participants, now working in the educational department of Austria’s Jewish schools came from the very region where these crimes were committed and admitted that this was all new to her. It made the present-day stance of the German nationalist party that under the likes of Jörg Haider had ruled Carinthia seem even more criminal and dangerous. Their fights to defeat bilingualism in Carinthia, their childish insistence that signs on the Autobahn point drivers towards ‘Laibach’ rather than ‘Ljubljana’ and their more recent political pronouncements that ‘Carinthia is now Chechen-Free!’ recalls a time in the not-too-distant past in which towns and communities were pronouncing with pride that they were now rid of all Jews. Few survivors could offer such an articulate account of their experiences and Dr. Sturm-Schnabl added much needed balance to most examinations of the Nazi years.